Scientists have claimed that there are basic building blocks of life found on Mars. Certain evidences from Martian also support the claim. 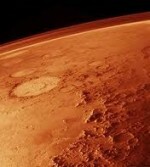 10 Martian meteorites were analyzed by a team at the Carnegie Institute for Science in the US. These have history of 4.2 billion years span. They also found that carbon present in the rocks was not the result of contamination on Earth; rather it came from the Red Planet. The team's leader Dr Andrew Steele told BBC News: "For about the last 40 years we have been looking for a pool of what is called 'reduced carbon' on Mars, trying to find where it is, if it's there, asking "does it exists?" "Without carbon, the building blocks of life cannot exist... So it is reduced carbon that, with hydrogen, with oxygen, with nitrogen makes up the organic molecules of life." He said the new analysis has answered the first question. "This research shows, yes -- it does exist on Mars and now we are moving to the next set of questions.